Snohomish County FC has quickly taken off with their social media presence and soon enough, they’ll be flying up the ranks of top lower league kits. I wrote about the club around the time they first got up and running and now, I am revisiting the team to look at their brand new, beautiful, and unique kits. I spoke with SnoCo FC General Manager, David Falk, about the new kits, which have preorders launching today. The kits will only be available for preorder for the rest of this month, so don’t hesitate to get your hands on at least one of these gorgeous jerseys. What was the inspiration behind the kits? The foundation of the Steelhead in our crest is hexagon "scales," and we wanted that foundation to be part of the kit as well. In the Primary Orange the hexagon foundation is a subtle 'pinstripe' hexagon pattern. in the Hex Grey Alternate / Away Kit it pops to the front in a big way and also takes the "scales" look further too. How did you settle on Icarus as the designer? We have been talking with Icarus for several months on and off about the kits. They have always been accommodating and quick to reply. They were willing to listen to various ideas and extra touches and then implement them. These were obviously the first custom kits in club history. How important was it to get it right and get an incredible kit? These will be our first custom kits, made only for use and worn by no other team in the world. So we have a large folder on the computer with scores of different styles, designs and near misses. It is probably good that it has taken us this long to be ready to order custom kits, because the wait helped the process of eliminating some unneeded elements. We will wear these for our first 2 years in league play, so we wanted them to look good. What was the goal when you guys set out with designing the kits? Our logo is both simple and complex. Yes, it is a single Steelhead fish within a simple black circle, but it is also a hexagonal pattern. How could kits be both simple and complex, or both complex and simple? The Primary Orange is the latter - simple beautiful 'Steelhead Orange' with a faded half fish at the bottom. But the hex pattern reveals there is more going on if you look closely. The Hex Grey is the opposite - a lot going on, but wait...it is actually just a simple hex pattern with shades of grey and black. What was your favorite part of the kit designing process? I love the creating. Even after the designs were chosen I wanted to keep making more. Not because we weren't satisfied, but because the process of trying new ideas and seeing new outcomes is so addictive. Which of the two kits is your personal favorite? Hey, I wanted us to wear orange since day one of the club. No regional adult men's club in Washington has orange as its main color. We are all whites, blues and greens up here for the most part. So the Primary Orange is my favorite. Needless to say though, I will be buying both. Could you explain the significance of the “Oso 43” for those unaware? In March of 2014 there was a devastating landslide in Northern Snohomish County near the town of Oso. 43 people were swept away in the mud in a matter of minutes. The neighborhood destroyed was called "Steelhead Haven," and we have vowed to honor their memories by putting "Oso 43" somewhere on all of our kits and also retiring the number 43. Our stadium is just 19 miles from the landslide area. Mark Lavis, who designed the Steelheads crest, also designed the "Oso 43" mark that will appear on the back neck of the shirts. Is the club close to securing a kit sponsor? If not, how could interested businesses get in contact with the club? We have until March 1 to place our order with Icarus to get the kits in time for the 2019 season. We recently ran a poll to see what people thought we should do if we didn't have a shirt sponsor. The vote was 52% to donate the space to a charity and 25% to leave it blank. We will just have to see what happens. We'd love a sponsor to help us out. We are still looking. Contact us at snocofc@gmail.com if you have any leads. Pre-orders start Friday, February 1st! How can fans get in on the action and how long will it be until they get their hands on the new threads? 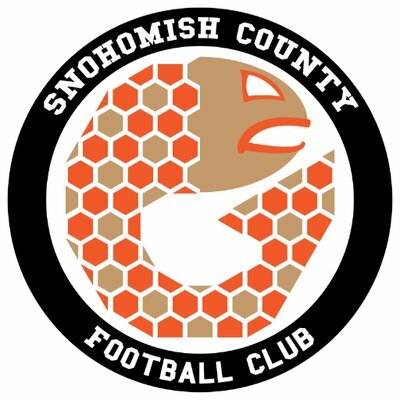 Fans can pre-order the shirts at SnoCoFC.com. We use PayPal. They are $40 each + $5 postage per entire order. They will have to be patient though. The cutoff date to order is February 28th but the shirts won't arrive at the club until mid April and then be shipped out to individual buyers after that. It's a pay now, be surprised around Easter kind of deal.